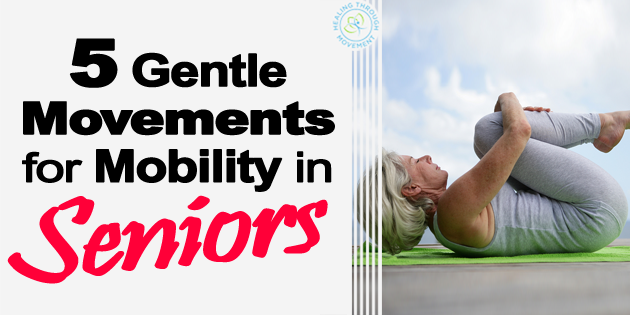 When it comes to seniors and the aging demographic, the research states that mobility is the key indicator of a healthy strong life. Lack of mobility will inevitably increase, joint stiffness, tightness, and difficulty moving around. It is also important to work on the joints in order to improve movement, work on balance, so you can stay physically active and for you to continue doing the things that you enjoy. Begin in an upright standing position, maintaining good alignment with your head, shoulders, and hips. Take a big step back with your one leg. Your toes are pointing straight ahead and straighten your back leg. Tighten up your abdominal area. Shift your hips forward and hold this position for 20 seconds. Return back to the starting position and repeat the movement on the opposite side. Start off with 1 set of 2 repetitions, ideally holding for 20 seconds. Perform the exercise in a smooth controlled movement with a good hold at the end position. Intensity is light. And the purpose of this exercise is to stretch the front of the hip. Begin in an upright sitting position on a chair or bench, maintaining good alignment with your head, shoulders, and hips. Place both hands on the side of the chair. 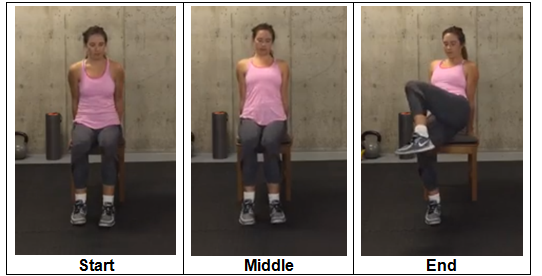 Straighten your arms out to lift your seat off the chair then bring one knee across your body. Return back to the starting position and repeat the movement on the opposite side. Start off with 1 set of 5 repetitions. 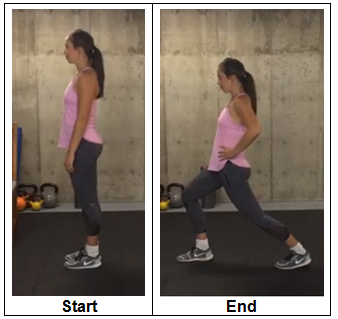 Perform the exercise in a smooth controlled movement with a good stop at the end position. Intensity is light to moderate. And the purpose of this exercise is to work on shoulder strength, core strength and glute and hip strength. Stand upright with one hand against the wall for balance, maintaining good alignment with your head, shoulders, and hips. Bring one heel up against your seat, holding your foot with your hand. Hold this position for 20 seconds. Return to the starting position and repeat the movement on the opposite leg. Start off with 1 set of 2 repetitions, ideally holding for 20 seconds. Perform the exercise in a smooth controlled movement with a good hold at the end position. Intensity is light. And the purpose of this exercise is to stretch the front of the thigh. Begin in an upright standing position, maintaining good alignment with your head, shoulders, and hips. Bring one arm up, bending at the elbow, then bring the arm across the opposite shoulder side. Hold this position for 20 seconds. Return back to the starting position and repeat the movement on the opposite arm. Start off with 1 set of 2 repetitions, ideally holding for 20 seconds. Perform the exercise in a smooth controlled movement with a good hold at the end position. Intensity is light. And the purpose of this exercise is to stretch the shoulder and shoulder blade area. Begin in an upright standing position with your feet shoulder-width apart, maintaining good alignment with your head, shoulders, and hips. Extend both arms in front of your body and bend your knees to move into a squat position, ideally bringing your knees to a 90-degree angle. Raise back up and repeat the movement. Start off with 1 set of 10 repetitions. 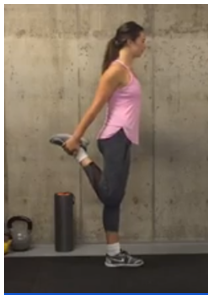 Perform the exercise in a smooth controlled movement with a good stop at the end position. Intensity is light to moderate. And the purpose of this exercise is to work on the mobility and strength in the ankle, knee and hip area. Give these 5 exercises a GO to help when it comes to loosening your joints and improving your mobility.